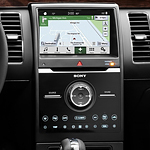 Would you like a midsize SUV with an abundance of innovative features? The Ford Flex is a popular midsize SUV at Broadway Ford that offers a variety of technology features that you can read about below. The Flex offers comfortable seating. It can seat up to seven passengers and comes with first-row bucket seats, a second-row split bench seat, and a third-row split bench seat. You can opt for the available second-row bucket seats with pass-through that can be conveniently folded so that third-row passengers can easily access their seats. The Flex also comes with available PowerFold third-row seats that can be folded flat with the push of a button for additional cargo space. You can also take advantage of ergonomic instruments and controls that offer a comfortable driving experience. The instruments and controls can be easily read during the day and night and are strategically placed so that the driver can access the instruments and controls with ease.